My husband and I love to travel. But when we travel we want our kids there. I would have a hard time enjoying myself away from them, and I love giving them the opportunity to explore the world from a young age. That said – traveling with babies and toddlers is not easy at all (although incredibly rewarding). The key to a smooth and enjoyable trip for all is being prepared. We are getting ready for a trip with both a toddler and a baby to Disney World in April, and then we have several other big trips that will be coming up in the summer and fall. I’ve been making sure we have the products that we need for our trip in April. 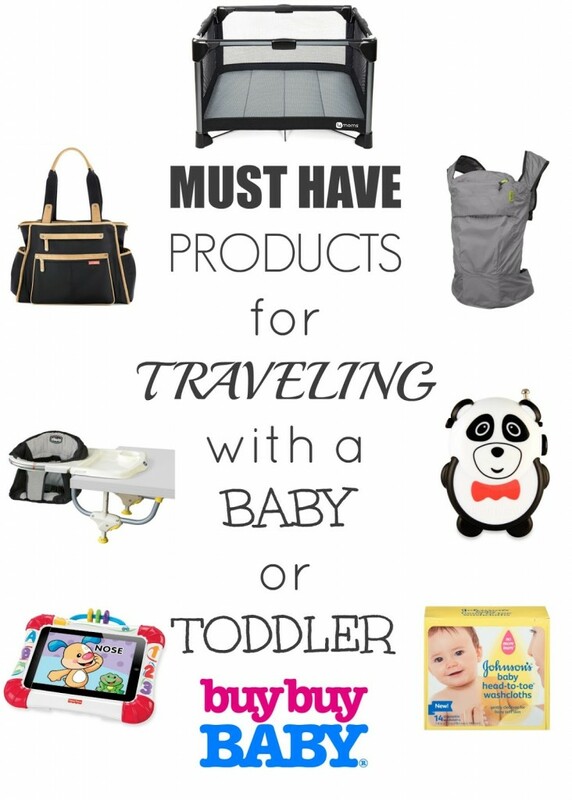 Since we’ve done a lot of trips, including an international one, with our daughter as a baby and toddler, I took the time to round up the must have products for traveling with a baby or toddler. SKIP*HOP® Grand Central Take-It-All Diaper Bag – I find that big, hold-it-all diaper bags are best for traveling. This one has plenty of compartments, is a great durable material, and comes with stroller hooks that are so convenient when you’re on the go. Buggygear™ buggyguard® Retractable Stroller Lock – If you’re going to be traveling in any crowded area that you may leave your stroller unattended in, aka amusement parks or tourist attractions, you’re going to want a stroller lock so you might as well get an adorable one. Dr. Brown’s® 30-Pack Pacifier and Bottle Wipes – These wipes are great for both travel and every day out and about use. They clean pacifiers, bottles, cups, toys – really anything that hits the floor and might have contact with your baby’s mouth that you want cleaned it can handle! Johnson & Johnson® Baby Head-To-Toe Washcloths – I’m assuming you really don’t want to worry about baby baths on your trip. Whether you’re staying somewhere that won’t have a tub, or just want to focus on relaxing, these washcloths allow you to clean your baby, toddler, or child without the actual bath. Chicco® 360° Rotating Booster Seat – I’m not sure how I didn’t know about high chairs that attach to tables when Maddie Grace was younger but I think they’re just genius. No need to keep a high chair at grandma’s or worry about a restaurant having a high chair with this. 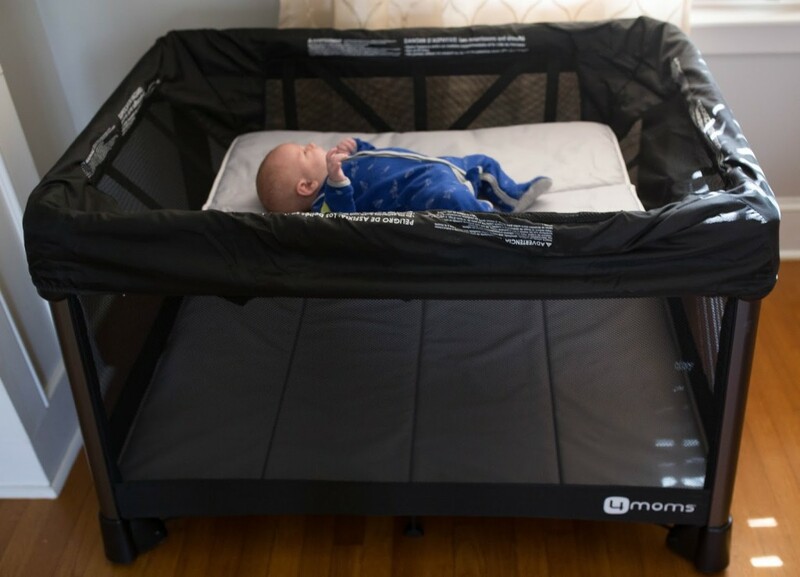 This one rotates so that you never lose sight of your baby! boba® Air Baby Carrier – If you plan on traveling with a baby or toddler and don’t know what babywearing is you need to learn ASAP. 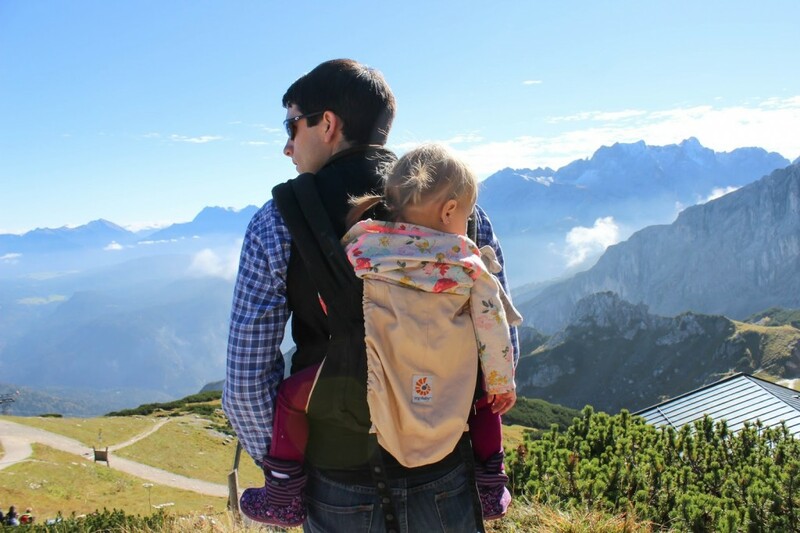 The Air is easily the best baby carrier for travelers – it folds up insanely small so it will easily fit in your carry on or diaperr bag , but is a great and comfortable carrier. 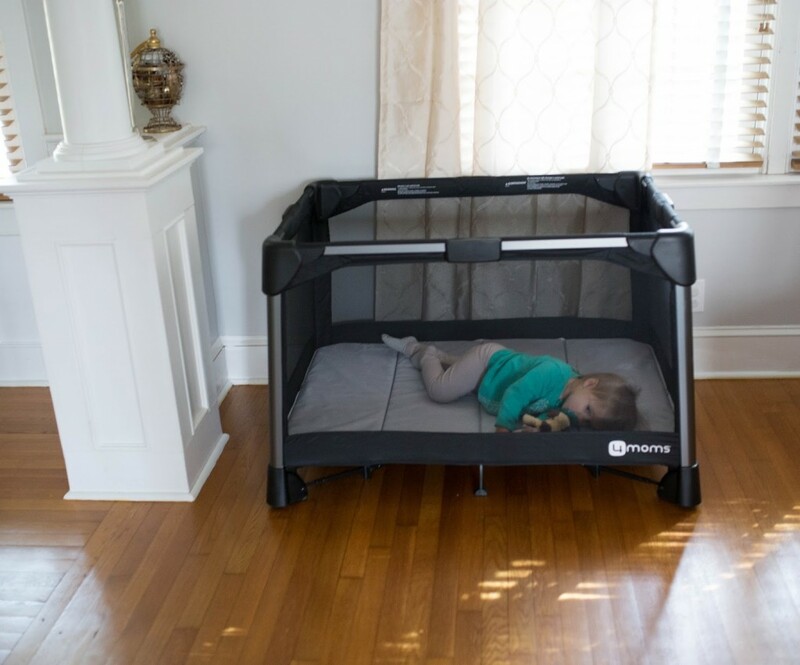 It’s lightweight so it will be great in all climates, and the adjustable head support makes it ideal for babies 3-14 months to be worn on your front or back. For older babies and toddlers the Ergo Original has served us well, but takes up a lot of space when can be a nuisance when traveling. Fisher-Price® Laugh & Learn™ Apptivity™ Case – We’ve all heard the no screen time before 2 rule – but that flies out the window when you’re traveling, right? And on bad days? And… well really anytime? Our iPad is probably the very most important thing for traveling with us, whether in car or plane. We have lots of Peppa Pig episodes on it that will keep Maddie Grace occupied for hours. This case will protect your iPad from the craziest of toddlers, while making it easy for them to carry. 4Moms Breeze – This is one of the newest additions to our baby gear collection. The last thing you want when you are traveling is to deal with the hassle of figuring out how to put together a playard. The 4Moms Breeze opens up just by pressing down in the center and closes by pulling up the center tab. Plus it comes with a bassinet perfect for baby to sleep in and diaper changes. This is the first playard ever that Maddie Grace has wanted to be in, and I love having it set up downstairs in our house so I have a place to change diapers and set Tripp down when I’m chasing Maddie Grace. The Breeze doesn’t take up much room when folded up and is definitely going to be joining us on our trip to Disney World in April! Are you planning a trip anywhere soon with a little one? For our big Germany trip back in September I went to buybuy BABY before our trip and a friendly sales assistant was able to help me figure out the perfect products to take with us and I highly recommend anyone doing a big trip with children do just this. Want $50 to buybuy BABY to get you started on stocking up on traveling products? I’ve teamed up with buybuy BABY to give one lucky reader a $50 gift card! Enter just using the form below and good luck! Thank you buybuy BABY for sponsoring this post! I was compensated for this post in the form of complimentary product. Regardless all thoughts and opinions are my own and I only recommend products I truly love. Also this post contains affiliate links, from which I may earn commission but at no cost to the buyer. When I was a kid I would have died to have an iPad or a great carrier to be walked around in! Our kids are so lucky today to have all of that! My fiancé and I LOVE to travel…it's our "thing" and we always talk about what will happen when we have kids!!! What a great, informative post! This is an awesome list! I can't wait to share it with a few of my friends who are also moms! It's crazy my son is 16 months old and I'm still trying to find what works best for family travel. I will share this list with my daughter who has a 2 year old and expecting twins in July!! Very helpful advice. I would love this for all the baby gifts I buy! Such a great list! We just had a regular Graco pack and play, but that 4 moms one is awesome! This is a great list for ideas while traveling. I have a two year old and five year old and will travel this summer. While we are out of "baby" items per se, there's still a lot to take while traveling with a Yong toddler. A baby carrier is definitely a must! I love ours and used it with both of my babies so much! We are the same way – we don't like to travel without Milly, and I know that we will be the same way with the new babe!! You are going to love Disney by the way!!! For us a good diaper bag, and stroller are always the key! We just took a trip in January with our 1.5 month old to Alabama to florida. We drove. Being prepared was the best thing we could have done. But bringing a bouncey seat was huge. Definitely needed that. And a sleepy wrap to wear her. Great ideas! I'm loving the 4 moms breeze. Will have to check that out. I have a 5 week old and we haven't done any traveling yet but hope to fairly soon! We really enjoyed traveling before we had our son and hope to share that with him! 🙂 The 4moms Breeze looks like it'd be amazing to take with us on our travels. 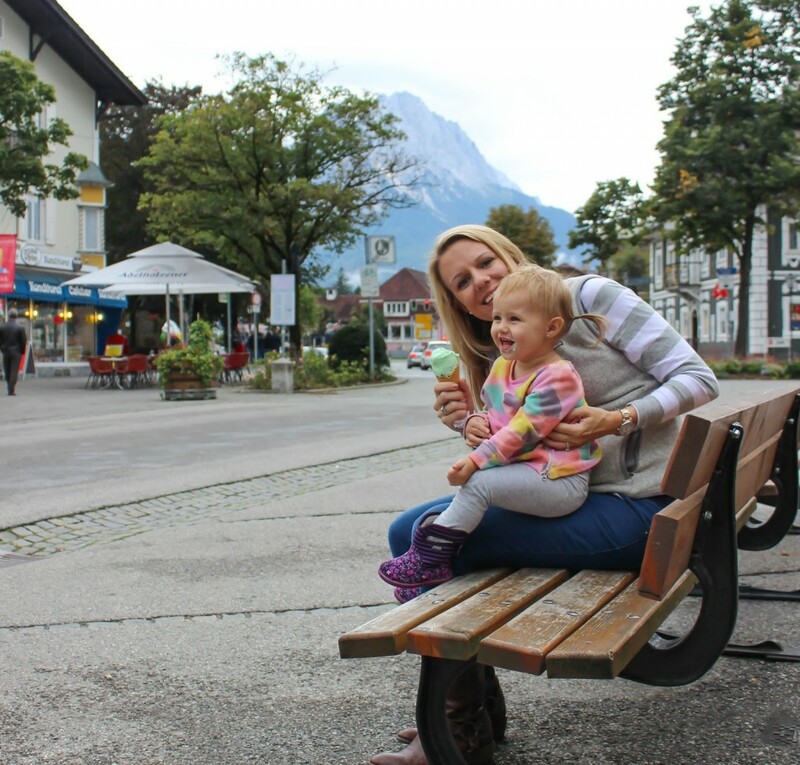 When I traveled with my kids, I always had snacks and toys or books to keep them busy. We would bring tons of snacks. We are expecting our first in September so we need pretty much…. everything. !!! It's a little overwhelming. In all the time we were raising babies, I never found a diaper bag I liked. We usually just used our backpack. I love the idea of a rotating booster seat! Having baby in August and we are already planning for some great adventures and baby essentials for some trips! Expecting my first in April and this list will come in handy. Thanks! We have only traveled once, but were so thankful we brought the sound machine!! The strange noises or lack thereof would have woken the babe! Yes, I have traveled with both and making sure you have a place to lay them once you get there is so important as well as toys! Traveling with the kids can be a huge mess!! But we do a ton of pre-planning to make sure it goes smoothly!! I think it is important to have a travel play yard, bassinet or place to sleep. I always traveled with my girls – they are grown now. I think it was important to keep age appropriate books, toys, etc. I would just say be prepared. Have snacks and toys to keep them entertained. Have everything planned. I have a one month old, but we haven't traveled with her yet. I think bringing a pack n play and toys are very important on top of normal diaper bag items.